The City of Ontario was incorporated in 1891. Prior to incorporation, Ed McManus served as the Town Marshall. He is remembered as the public-spirited individual who, clad only in his long-handled underwear, would run down Euclid Avenue Alley, as he paced the fire fighting equipment to a midnight blaze. In November 1891 L.J.E. Tyler was elected as the first City Marshal. Tyler had the distinction of being the entire police force. To get added law enforcement at night, local merchants hired George Emmons in 1907 as the night watchman. Standard equipment consisted of a flashlight. Between Marshall Tyler's reign and the appointment of the first police chief, several gentlemen served as city marshal. In 1900 when George Hansen was appointed as marshal, the population of Ontario had risen to 722 and encompassed 3.2 square miles. The City's first police chief was appointed in 1907. Walter O. Hardy served in that capacity for 20 years. The City grew rapidly, and by 1910 the population was 4,274 and covered 11.8 square miles. A police headquarters was established in the new city hall, which had been converted from a former country club. The first motorcycle officer, Wiley Poindexter was hired by Chief Hardy in 1915. Chief Hardy continued to serve as the head of Ontario's law enforcement until 1927 when Arthur Axley succeeded him. 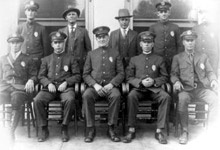 Chief Axley led the department until 1934 with 13 sworn officers and one policewoman. By 1930, the city hosted 13,583 citizens. It was during the tenure of Chief J. Lorraine Lock that one-way police radios were introduced. Prior to this, officers were notified of a pending call by looking for a red light on light standards throughout the city. Chief Lock was replaced in 1936 by Chief J.C. Smith. 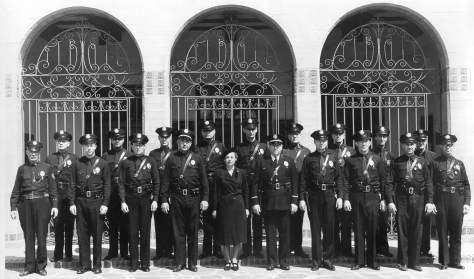 The police department moved to new quarters in the newly erected city hall at 225 S. Euclid Ave. During this time, the population of the city had increased to 14,197, two-way radios were installed in police cars, and the City of Upland annexed some of Ontario’s real estate, reducing the city to 9.9 square miles. Chief Smith passed away suddenly in 1941 and was succeeded by Chief C.F. Robertson, who served until 1943 and was replaced by Chief H. W. Swinney. Chief Swinney served the City of Ontario and its citizens from 1943 until his retirement in 1970. He was succeeded by Chief D. Burke, who left Ontario in 1973 to become Chief for the City of Walnut Creek. L.M. Kolbreck became chief of a police department, which had grown to 130 sworn officers serving a population of 123,000 people and policing nearly 50 square miles. It was under the guidance of Chief Kolbreck that the department instituted computer aided dispatching, founded a crime analysis unit, began a K9 program, and returned motorcycle patrol to traffic enforcement. Chief W. Simmons took the reigns of the department at the retirement of Chief Kolbreck in 1986. A very popular chief, his brief tenure ended when his sudden death during routine surgery shocked and saddened the men and women who served with him. The leadership of the department fell on the shoulders of Captain Lowell Stark who was appointed Chief of Police in 1988. Chief Stark oversaw the department as it grew to more than 200 officers. During this expansion, the department developed its own forensics unit, added off-site specialized units, and instituted the air support division. Chief Stark made strides to meet the technological challenges of the 21st century by forming a department task-force to develop a strategic plan. Chief Lloyd Scharf took command of the Ontario Police Department in 1995. Chief Scharf was instrumental in the formation of a COPS program, expanded the reach of the department to include a second neighborhood office, instituted a technology unit, and brought the California Police Chiefs Annual Conference to Ontario. In addition to these accomplishments, Chief Scharf is best remembered as being the chief who guided the Ontario Police Department to its new home—a 180,000-square-foot state-of-the-art police building. Chief Jim Doyle, who was appointed as Ontario’s first Deputy Police Chief in January 2003, assumed leadership of the Ontario Police Department in May 2004. Chief Doyle is a career officer with the department starting his career with Ontario as a police cadet in 1973. Chief Doyle retired in 2009. Chief Erik Hopley took over the role of Chief of Police in 2009. He remained Chief until his retirement in 2014. Chief Brad Kaylor was appointed to Chief of Police in December 2014. He served the community for over three years until his retirement in 2018. The current Chief, Derek Williams, was sworn in on April 3, 2018. Through the leadership and philosophy of “Excellence through Teamwork,” Chief Williams is guiding the department in providing the highest level of police service while fostering community partnerships to enhance the quality of life in our community. Chief Williams and the men and women of the Ontario Police Department are pleased to participate with City staff in the planning of the Ontario Ranch, as well as other significant development projects in Ontario, to ensure that all levels of public safety are thoroughly addressed.